Which came first: the chicken or the egg? The question is one of the oldest nerdy conversation starters, especially if you’re talking to an evolutionary biologist. Recently, scientists from the Ludwig Maximilian University in Munich, Germany went after a more strange which-came-first problem, this one involving a bird and a flower. The passionflower is one of the most striking flowers humans have ever seen. Its five petals come in bright shades of yellow, blue and pink. Their fruits have a strong sugary smell, and passion fruit juice is often mixed with other fruit juices to make them more aromatic. There are more than 530 species of passionflowers. They are found mostly in South America, around the Middle East, South Asia and Australia, and they are cultivated in North America as well. Botanists think the brightly colored petals help the flowers stand out from their surroundings and make it easier for certain species of birds and insects to pollinate them. In fact, because some passionflowers have very long nectar-tubes, only birds with very long beaks can reach into them and act as pollinators. The German scientists wanted to know which had come first: passionflowers with 10-cm nectar-tubes, or the sword-billed hummingbirds with 11-cm beaks. After all, one can’t survive without the other. Nectar is a crucial source of nutrition for the birds and the flowers reproduce via pollination. By analyzing the DNA of 43 species of passionflowers, the researchers found that the long-stemmed variety had evolved 10.7 million years ago, shortly after the sword-billed hummingbird had emerged as a distinct species. After that, the flower and the bird evolved together. Where sword-billed hummingbirds lived, long-tubed passionflowers grew, and vice versa. The findings were published online in Proceedings of the Royal Society B on October 2. Such co-dependent evolution is already commonly found in nature. A famous example is of acacia ants and bullhorn acacia trees. The wasp-like ants are known to attack crickets and goats that prey on the tree’s bark and leaves. In exchange, the tree produces a sweet nectar that the ants feed on. This behavior ensures the perpetuation of both species. Another similar example is the yucca plant pollinated by the yucca moth. The symbiosis is essential for most animals and plants to occupy common habitats. But for this particular study, the research team made a more compelling discovery. The scientists sequenced the DNA of the 43 passionflower species to check how they differed; the differences would reveal when they last shared a common ancestor. They found that the evolution toward longer nectar-tubes had happened very rapidly and more than once, too. 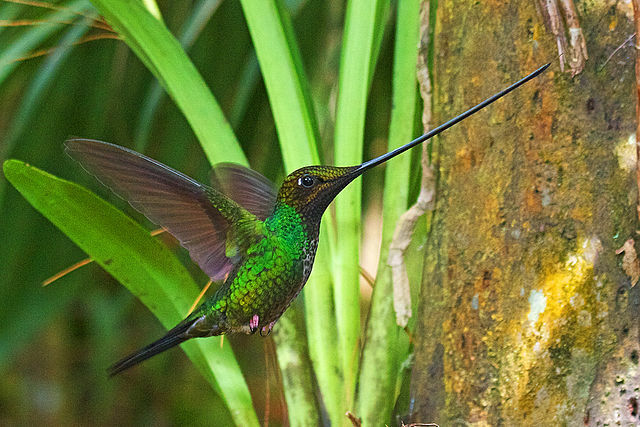 When sword-billed hummingbirds had been in short supply in the last two to four million years, some passionflower species had quickly evolved to grow shorter tubes that could be pollinated by more birds and bats as well, ensuring their survival. “That is why it is sometimes advantageous to break the highly specialized relationship with a single pollinator – and the group of long-tubed passion flowers we have studied includes good examples of such evolutionary switches,” said Susanne Renner, a professor at Ludwig Maximilian University a co-author on the study, in a press release. The finding was unexpected because evolution has often been thought of as a one-way journey, where if one codependent species was disturbed, the other half would be disturbed, too. The story of the long-tubed passionflower changes that, forcing us to think of evolution as a more complex negotiation between animals, plants and their changing surroundings. Sometimes, it turns out, survival of the fittest is actually survival of the faster evolver.